Seeing the picture of Barry Bonds wax body in the LA Times being removed from a San Francisco wax museum, I just had to visit my Hollywood Heads of Fame suggestion one more time. 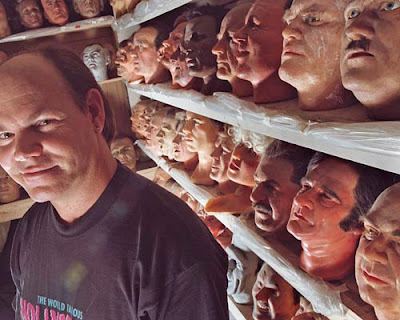 HHF was my idea of how to use the discarded heads of celebrities once they were removed from their bodies and stored on wax museum’ shelves. Several years ago while shooting a story for a Fight Back! with David Horowitz story for NBC, our crew happened to be in front of the Hollywood Wax Museum. One of my producers went inside to ask if they still had my figure that was formerly displayed in the museum in the 60s. It seems they didn’t have the whole figure, but, like all discarded celebrities (discarded? Ugh), they had my head stored in a special room. My HHF idea was to take all discarded heads and put them on lampposts along Hollywood Blvd. and call it the Hollywood Heads of Fame. Good idea? Well, so far no one from the Hollywood Chamber of Commerce has called. However, how can they ignore this? Barry Bonds, baseball's all-time home-run king with 762 swats, has joined the ranks of the headless and his head is being put away forever to sit on a shelf basking in has-been celebritydom (sic); allegations of steroid use and perjury still hanging over his head. In the 70s, I created along with Shelly Saltman, a TV sports game show called Pro-Fan. Each program featured a top sports pro as a teammate to a sports fan. Over the run of the show we had dozens of the top pros of the game. I got to know these guys and gals and I can tell you that stress is their main complaint. Trying to stay on top of the game. Some were taking pain pills or some other prescription drug for game ending pain all the time. Wouldn’t that pass as some kind of enhancement over the pros not taking any drugs at all? One thing that impressed me the most was the fact that all of the pros I met had great attitudes and loved their fans. Then, there was Babe Ruth. His home run record was surpassed years ago but he remains the #1 icon for home run hitting. Why? Didn’t he also take a few enhanced drugs now and then? His choice might have been alcohol, but a drug none the less. His main attribute? The Babe was a jolly fellow. He always had a smile for his fans. What do I think. I think we should never forget his record. He did it. Even though he had to become the incredible hulk each time he smacked a ball into bleacher heaven, he did it. You can’t just take it away by cutting off his head. Bottom Line: I elect Barry Bonds to be part of the Lloyd Thaxton Hollywood Heads of Fame. Yes, Bonds cheated. So did Clemens, McGwire, Sosa, Canseco, Pettite, Palmeiro, yadda yadda yadda......but guess what? It was NOT ILLEGAL to take the drugs "at the time!" Should the records stand? Yes, but with an asterisk*. I don't like the way they got to the records, but they did it. The policies of drugs in the game now are SOMEWHAT in force. Look at the homerun stats now. They are down. Here in Minnysoda, we have a couple of players who just in the last couple of years hit homeruns like it was the easiest thing to do. How are they doing this year? One guy has ONE homerun at this point (granted, he was injured for two weeks...big whoop) and the other guy has NO homeruns yet. Were they on something a couple of years ago? Hard to say. Some say it's the bats this year. Oh yeah? Then how do you explain the 3 scrawniest guys on the Twins having 2, 3, 4 homeruns compared to the "powerhitters" the Twins have? It's a mystery, I tell ya! Anyway, let the records stand on the accused (Bonds, Clemens, McGwire, etc.) but Baseball Hall Of Fame? NO! Keep da bums out! 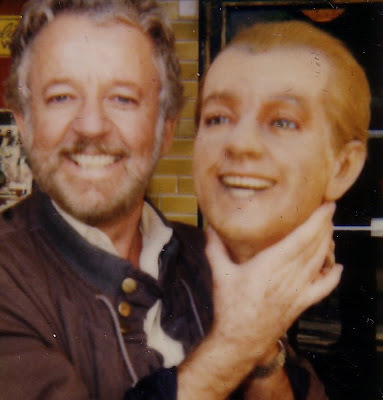 As for Barry's wax head? No comment. I think Barry Bonds should be elected to join the LTHHF with an asterisk comparing the circumference of his head when he entered the league to the size when he broke the record. I was looking for a reference to the "Showcase 68" episode in Berkeley with the Chambers Brothers, and came across this blog. I was at the event by accident, touring Berkeley on a visit to SF just before going in the Army. It was a wild scene, with the Berkeley crowd in full bloom, so to speak, almost rioting when the Bobby Goldsboro segment had to be retaped several times. A couple of months later I spent a lot of time cleaning my rifle in basic training, and "Time has come today," the full version, often accompanied the task on the radio. Creedence's "Susie Q" was the other tune that came up many times. In 1969 I was sent to Germany, and one day while I was watching Armed Forces Television, the "Showcase 68" segment from Berkely was broadcast. It was surreal, watching the show I attended on a black and white TV in a dingy barracks in Kaiserslautern, Germany. It was funny that the Bobby Goldsboro part was filmed/taped somewhere else, near a beach if I remember right, under some trees. I remember your TV show. I didn't "get it" until one day you were lip synching the Moody Blues's "Go Now." It was so ridiculous that I went into uncontrollable laughter. It was then that I recognized the talent and courage, really, that it took to go out there every day and leave your ego behind in order to give people some enjoyment. Another song I remember was Procol Harum's "Whiter shade of pale." Priceless. Research Video stores the tapes for SHOWCASE '68...IN COLOR, TOO! It's too bad that nobody will ever see that great footage, though. It'll be stored and lost in time forever, like many old rock shows. I didn't read it. The story. The thing about Bonds. But jeez, back in '66 I used to watch you in Reno. Crazy beatnik tapping out, I think, Bill Black's Combo's "So What?" in front of the malt shop or whatever. What class! We were younger, much. But class is class. Even for lefties. And the things you did with album covers? Before even Monty Python? I wonder if Terry Gilliam and later JibJab ever gave you credit? You were the first. Amazing. I can't remember what happened yesterday, but I can remember most of your shows very clearly. And I don't mind doing so. Makes me feel younger. A lot younger. In fact, I was trying to get Bill Black's "So What?" but the thing on Amazon isn't even close. But while searching I naturally thought of you, and here you are. Stay healthy and happy, maestro. You'll always be a beacon to us, those you've touched. I think you should elect Ted William's head. First off, Roger Maris shouldn't even be in the record books since he broke the Bambino's home run record due to an extended season. As far as Bonds' McGwire and Sosa - No way! They cheated! You have to wonder how many Ruth would have hit on steroids, then see if his record could be broken.